Good news everybody! The trio who brought us the cult TV series Spaced, black comedy Shaun of the Dead and spoof action comedy Hot Fuzz are thankfully at it again, recently revealing the basic details of their upcoming film The World’s End, with filming due to begin in September this year with a proposed release date for early in 2013. Edgar Wright, Simon Pegg and Nick Frost will be working together on a comedy, with the official synopsis on Simon Pegg’s site peggster.net being: 20 years after attempting an epic pub crawl, five childhood friends reunite when one of them becomes hell-bent on trying the drinking marathon again. They are convinced to stage an encore by mate Gary King, a 40-year-old man trapped at the cigarette end of his teens, who drags his reluctant pals to their home town and once again attempts to reach the fabled pub, The World’s End. As they attempt to reconcile the past and present, they realize the real struggle is for the future, not just theirs but humankind’s. Reaching The World’s End is the least of their worries. There’s obviously a lot that’s not being revealed about the plot, but with enough hints being dropped about larger forces at work pursuing their own nefarious schemes, this will no doubt follow the much loved format of a normal bloke going about his normal life and attempting to carry out a normal blokey things while thwarting the forces of evil and saving mankind (or, in Hot Fuzz’s case, the town of Sandford). The writing duo of Wright and Pegg have had this film in the works for quite some time, with the two always planning to complete what they call their ‘Three Flavours Cornetto Trilogy’, also known as the ‘Blood & Icecream Trilogy’ which makes reference to their running joke about Wright’s belief that Cornetto’s are the perfect cure for a hangover. 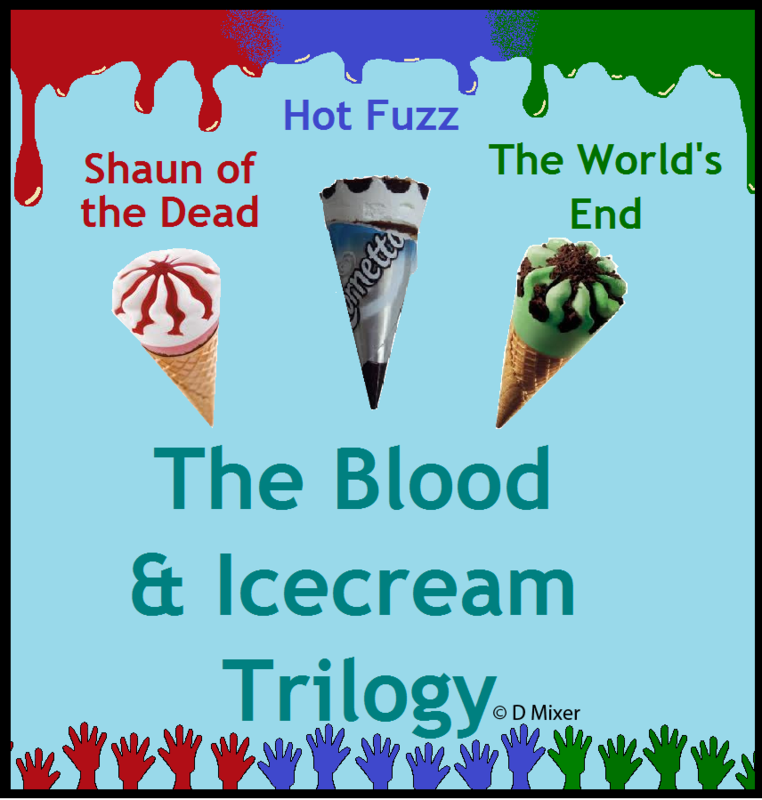 Each film is visually connected to a flavour of Cornetto ice cream of a flavour that suits the film, with Shaun of the Dead featuring a red-wrapped strawberry flavoured Cornetto, Hot Fuzz featuring a blue-wrapped vanilla, chocolate & nut Classic flavoured Cornetto and The World’s End to feature…well, us fans have our money on the green-wrapped Mint flavoured Cornetto. As with a lot of Edgard Wright and Simon Pegg’s work, there’s a lot more going on than meets the eye, with relatively normal things having a far deeper symbolism: their Three Flavours Cornetto trilogy is a reference to the work of Krzysztof Kieślowski’s, a Polish politician and screenwriter who co-wrote Three Colours film trilogy, which was made up of films each named for the colours of the French flag, with plots dealt loosely with the three political ideals of the French Republic motto, which are respectively liberty, equality, and fraternity. Regardless, I can’t tell you how excited I am that we get to see another writing lovechild from expectant parents Edgar Wright and Simon Pegg, as well as enjoy the almost heavenly comic pairing of Simon Pegg and Nick Frost.